In 1979, a small group of families made a commitment to create a center for Jewish life in Vero Beach. The first Services were held at St. Helen’s Parish Hall. Every Friday night the group prayed in the warm glow of the Shabbat candles. A wooden Ark was soon built and it was designed to be portable. During the High Holy Days the Ark was moved to the Community Church. 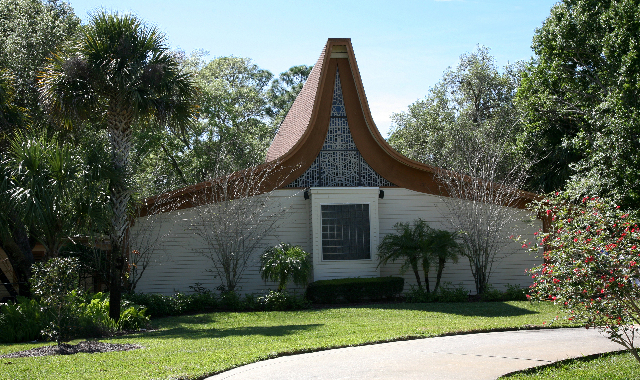 Inspired by the Ark and the Torah inside, Temple Beth Shalom was established at its present location in 1984. The site of the building was chosen because of the beautiful trees that surrounded it. The roof of the synagogue is older than the rest of the building. Charles Block, an architect and one of the founding families saw the roof dismantled from a church being torn down while he was driving home from South Florida one day. He stopped and inquired about the unique roof that was designed as hands praying to heaven. All in one year Mr. Block purchased and stored the roof and funds were raised to break ground. Skylights were added for natural light from heaven and a window to G-d. The building was completed in 1984. Local artist Paul Pickel designed the stained glass which faces East towards Jerusalem and is located above the Ark. The school wing was built in 1987, with a playground added for the children in 1997. In 2007 the Block family donated our biblical garden that winds along our path that connects our campus. Temple Beth Shalom has had full time Rabbis since 1980. Temple Beth Shalom is a Reform Jewish congregation dedicated to Jewish values of study, worship and social responsibility. As a caring community and House of Peace, we strive to meet the spiritual, intellectual, social and cultural needs of each member of our Temple family. Our clergy and members work together to create an atmosphere where we all strive to perpetuate Judaism by engaging in lifelong learning, embracing Israel, performing acts of social justice, cherishing the Torah, and worshipping together. Our diverse community is welcoming to Jews of all backgrounds including interfaith families. Within our warm and inviting surroundings, we, the community of Temple Beth Shalom, encourage meaningful participation and create a special sense of belonging. We focus not only on what you believe or how you “do” Judaism but on belonging to a community where you can celebrate your simchas (sweet moments), find support through tzuris (challenges), find holiness in your everyday life and make our world a better place. It’s different quantitatively, of course. We don’t have as many members as large congregations do. It’s different qualitatively as well. There are things they have that we don’t. But there are also things we have that they don’t. WE HAVE A SENSE OF FAMILY. WE HAVE A SENSE OF TENACITY. We know how fragile our presence is and how important it is that we stay alive, stay involved and stay together no matter what — so we do. WE HAVE A SENSE OF INVOLVEMENT. Organizational research indicates that most organizations operate on an average level of involvement of five percent of the membership. It’s rewarding to know that most of us are involved most of the time. WE HAVE A SENSE OF RESPONSIBILITY. There is saying that goes, “Pray as if everything depends on God; act as if everything depends on you.” When everyone depends on you, you tend to carry through. You may not always want to, but you do what you have to do — and more often than not, you end up glad that you did. WE HAVE A SENSE OF TOLERANCE. We often exist in areas isolated from mainstream Jewish life, where most of our best friends (and our kids’ best friends) are not Jewish, and where many of our marriages are or were mixed. Here, our survival may depend not on turning in on ourselves, but on sharing what we have so that others may see we have something worth looking for. We get to know our rabbi, one-on-one — and the rabbi gets to know us. WE HAVE A SENSE OF CONTINUITY. We grow up with close, personal role models of all ages. We have a wide diversity in age, but we aren’t big enough to stratify by age. We’re not a group of old folks and a group of young folks — we’re just folks. We realize that we have the responsibility to carry on the traditions of Judaism in places not ordinarily known for their Jewish culture — and we do it with all the enthusiasm and energy we can summon. Adapted from words by Mary Hoffman of Congregation Etz Chaim in Merced, CA. Throughout history, Jews have remained firmly rooted in Jewish tradition, even as we learned much from our encounters with other cultures. Nevertheless, since its earliest days, Reform Judaism has asserted that Judaism is not frozen in time. It is not an heirloom. Judaism should be a living fountain. Reform Judaism believes in the principal of personal responsibility. Each and every one of us has a right and responsibility to engage with Jewish culture, history, tradition and law to decide how to live a meaningful and valuable Jewish life. How do I become a member of Temple Beth Shalom? What is the process? We’d love to have you join us. Just e-mail us at tbsoffice@tbsvero.org or call us at 772.569.4700 for more information and a membership packet. Why should I join Temple Beth Shalom? Temple Beth Shalom is home to one of the nicest groups of people in town. At Temple Beth Shalom, we support one another with a caring community and a culture of inclusiveness. We have weekly worship opportunities, adult education, religious school for children, many groups and clubs, and great opportunities to meet other people at our religious, cultural and social events. I’d like to join, but I don’t know anyone at Temple Beth Shalom. We have lots of opportunities for getting involved and meeting people, starting as soon as you join if you so choose. Probably the best way to get to know people is to get involved. Every time you come to our campus or out in the community, you have the opportunity to meet and interact with members of our congregation. Why should I join now? My child is only an infant. It is never too soon to be a part of the Jewish community. Babies grow up fast. They start asking questions and interacting with the world at a very early age. By joining our congregation, developing connections to the members of our community and strengthening your Jewish identity, you will offer your growing child not only your knowledge but the support of a caring community and a four thousand year old tradition. Before long (when your child is 18 months old) you will be able to register for our outstanding Torah Tots program. My kids are grown. Why do I need a synagogue? While we offer many family-oriented programs, that does not mean we are only open to families with younger children. We focus on community building, with Sisterhood, Men’s Club, adult education seminars, leadership opportunities, and, of course, worship experiences. The synagogue’s task is to enhance your connection with other Jews and your personal search for meaning and holiness. What does it cost to join Temple Beth Shalom? Isn’t it expensive? A Jewish sage once said that “the Gates of Prayer are always open.” Reform synagogues are committed to keeping their gates open and inclusive to all, and Temple Beth Shalom is no exception. While the Temple has expenses like any other organization, we strive to ensure that financial constraints are never an obstacle to membership. Confidential discussions on reduced dues are encouraged if that will enable you and your family to be part of our community. Yes! Many of our current member families are interfaith. We welcome members from diverse backgrounds. For more information, give us a call. Learn about Temple Beth Shalom by coming to Temple. Join us at Shabbat services; meet with the Rabbi, the Cantor, our staff, and our welcoming congregants. You can find out upcoming events from our Scroll newsletter or our website calendar, E-mail us for more information at tbsoffice@tbsvero.org. or phone 772.569.4700.